12/8/01 – Pauline took the kids to an exhibition of swordfighting and suchlike at the museum … Sean apparently spent hours talking to a ‘medieval carpenter’, who gave him and Susanna a wooden spoon each. 13/8/01 – Sean went to Martin’s for a sleepover. 16/8/01 – Pauline took Sean to Cavan … Sean bought some fishing gear (he now spends a lot of the time talking about flies and so on) … Oliver, the ginger kitten from across the way, kept Sean an me amused for some time with his antics while Susanna and Pauline were off for a walk. 18/8/01 – Pauline dropped off Sean, Susanna and me at the nine-eyed bridge to do some fishing. The kids had collected some worms. I had soon caught a small perch, which we put back. We all did some fishing with worms and a spinner, and Sean and I fly-fished as well. It was Susanna’s first time to do proper angling, and she loved it/ Now she is going to buy a rod out of her own money … I had a game of chess with Sean. 19/8/01 – Pauline and I agreed to take the kids fishing ‘for an hour’, but of course the four of us spent much of the afternoon near the nine-eyed bridge … towards the end Sean caught two perch with a spinner, much to his delight. 20/8/01 – Sean and Susanna went to the farm. 22/8/01 – Sean, Susanna and I fished for a couple of hours, with no luck. 25/8/01 – Sean and I cycled to the nine-eyed bridge and spent about three hours fishing – didn’t catch anything. It was a beautiful day. The cycle down was enjoyable, but coming back was hard work. 29/8/01 – Sean and I played fishing games with Andy on the lawn again, and I took the three of them fishing … I caught a ridiculously small fish, and Andy caught a small perch; otherwise we had no luck although there were nice fish in the river and we had it to ourselves. 31/8/01 – Sean and Andy played a fishing game on Sean’s computer. 2/9/01 – Nuala drove Sean, Susanna, Andy and me to the nine-eyed bridge, and we fished for a few hours. Sean caught several small perch with a spinner. The kids chatted to Thomas Anthony King, who showed them a photo of the 8.5 lb trout he caught there recently. 3/9/01 – The kids started back at school today … Pauline took the traditional first-day picture at the front door. Sean goes into 5th class and Susanna into 2nd … Sean was enthusiastic about his first day in DC’s class – DC had talked about history a lot, and Sean finds this very interesting. 4/9/01 – Sean was out playing with a large gang of kids. 6/9/01 – The kids are well back into the routine of school … Sean partakes in a huge game of ‘tig’ each day. 14/9/01 – Sean, Susanna and I went fishing for a couple of hours at the nine-eyed bridge, where we chatted with Thomas Anthony King. The weather turned very wet and windy while we were there. Sean caught a perch and returned it. 18/9/01 – Sean had a dental appointment in Ballyjamesduff. His teeth are perfect. 19/9/02 – We and Sean discussed the projected pond, and Sean did some work on clearing away a low wall so that Eamonn’s digger will eventually be able to gain access. He’s hoping to be able to fish in the pond, although I’ve told him that this is unlikely. 22/9/02 – Pauline dropped Sean and me at the nine-eyed bridge for a couple of hours’ fishing … we caught only a small perch each, but had a nice time … Sean is doing good work on the garden these days, clearing away an old wall. 24/9/02 – Sean, Pauline and I watched a documentary on the Battle of Kinsale, which was pretty good. Sean has been doing this period in history lessons at school, and is very interested in history. 27/9/01 – Andy was here in the afternoon and brought four dead roach with him, which Sean and he used for fishing games … Sean and Andy cooked mackerel for themselves. 29/9/01 – Sean, Andy and I went fishing for a couple of hours near the nine-eyed bridge. Sean caught two perch and I caught one – we put them back in the water, of course. That is a lovely photo, Brendano, lovely memories too. 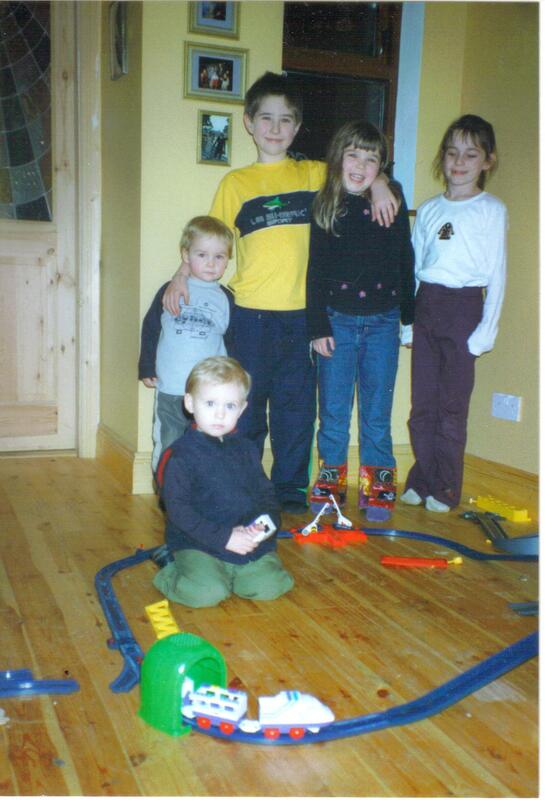 The little boy sitting on the floor looks uncannily like someone I knew and looks about the right age for 2001. Does his name start with M? Thank you, Shermeen The photo isn’t as crisp as it might be, but yes, it’s a nice one. OK, so I was merely imagining things. No, Shermeen – you are correct. 🙂 Pauline designed and made the door panel when we first moved into this house. It doesn’t show well in the pic, but it has some nice greens and yellows. Bit annoying to see different avatars appear with my comments. I wish I could stay logged on. Is there anywhere on your page (I cannot find it) that prompts users to log on? I can’t believe it’s almost 10 years since we fished at the nine-eyed bridge that day Brendan. Do you remember the large dead fish that Sean found? It was a bit mangled but I think for a second Sean was considering taking it home! Hi Dave … good to see you. Yes, it’s amazing that 10 years have passed. As I recall, we were standing on the spot from where Sean later took the photo in my banner. Yes, in my minds eye I can still see us standing there with the bridge as backdrop.